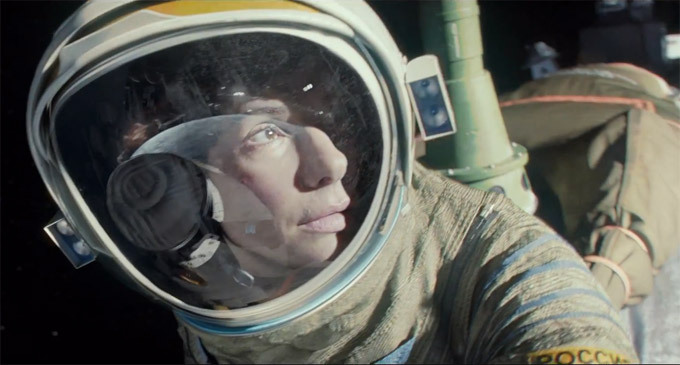 We haven't seen much from Alfonso Cuaron's Gravity yet, but what we have seen has kinda blown us away. The gorgeous above-Earth imagery combined with some awe-inspiring camerawork look to make for an incredibly unique experience at the movies when the film touches down this October 4. In this five-and-a-half-minute trailer, we get some fragments of scenes already previewed, except they've been extended to tease some of what we'll see after a horrific accident leaves at least three astronauts fighting for their lives. Sandra Bullock and George Clooney play two of those astronauts, and it seems like the less we know apart from that, the better. Gravity looks like one of those movies you don't just watch, but you experience. Maybe not a great time out for the motion-sickness crowd, but if you're a fan of expert filmmaking and movies that push your senses to uncomfortable yet rewarding levels, then Gravity is something you'll need to see on the biggest screen possible. Just the thought of watching this in IMAX gives us goosebumps and a stomach ache. Adjust your eyes, hold on tight to something and watch this thing play out below.